← The “plurimulti” charade begins to fade out! The following news from El Deber [07/20/2016], reflects how alternative development, has worked in Chapare, despite the ruling of the coca grower caudillo! 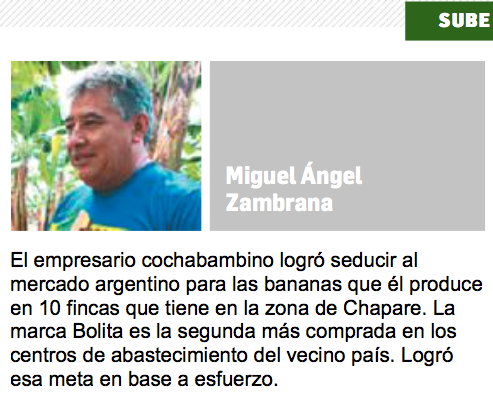 The cochabambino entrepreneur managed to seduce the Argentine market for bananas that he produces in 10 farms that he has in the Chapare area. The “Bolita” [such term was used derogatorily by Argentinian people to Bolivian immigrants who work in Argentina] brand is the second most bought in the supply centers of the neighboring country. He achieved that goal based on effort. Alternative development were the efforts that Bolivia along countries like USA and some of the EU have embarked upon since the mid 80s. It was supposed to offer alternatives to farmers to produce other crops than coca which is used for the narcotrafficking. USAID/Bolivia had made the banana business possible and Mr. Zambrana was one of the visionaries who, from the beginning, so possible to have a clean, legal way to make money without engaging in the coca/cocaine business. It is highly commendable to see this top line entrepreneur who had overcome even personal threats to his own security and made this business possible! This entry was posted in Bolivia, Business, Cochabamba, Drug war - narcotraffick, Economics, Politics and tagged cocaine production, competitiveness, public policy failures. Bookmark the permalink.